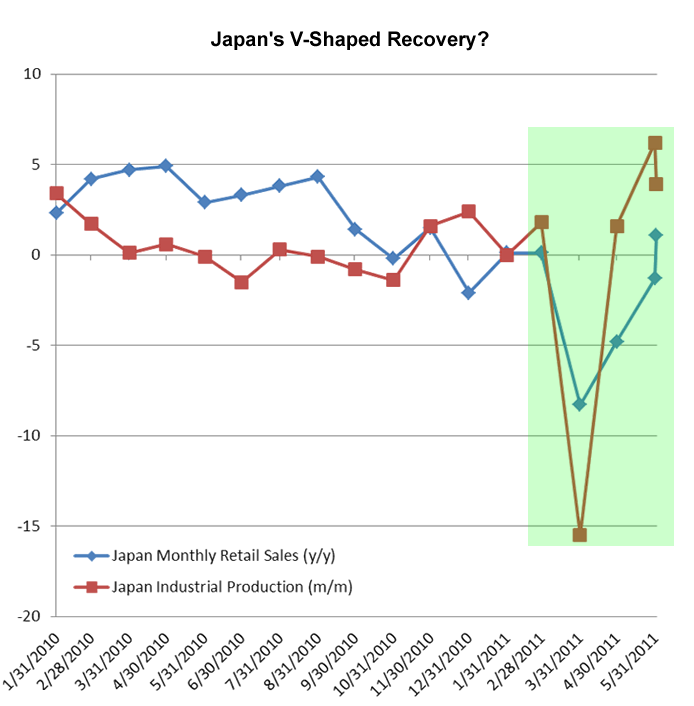 Is Japan Really on a V-Shaped Recovery? If you’ve been talking to some market optimists, then you’ve probably heard that Japan is on a so-called “V-shaped” recovery. And why not? Retail sales in Japan recently surprised markets with a 1.1% annualized rise in June, the first positive reading since the earthquake and tsunami in March. What’s more, industrial production also picked up 5.7% in May, the fastest pace in 50 years. Talk about gaining steam! But are these developments really enough to be labeled a V-shaped economic recovery? I personally don’t think so. As I’ve mentioned in a previous article, Japan has been able to pick up the pieces somewhat, but we have to look beyond retail sales to get the full picture (although I do admit, the retail sales chart DOES look V-shaped). It’s important to remember that a huge chunk of Japan’s economy is export-related. If we take a look at its latest exports data, we’ll see that it was still down 1.6% in June from a year earlier. Sure it’s just a small drop, but if you compare it to pre-global recession levels, you would hardly call it a recovery. In addition, Japan’s new vehicle sales recently dropped by a record 27.6% in July as production disruptions continued to take its toll on Japan’s leading industry. If you expect smooth sailing ahead for Japan, you’ve got to be out of your mind! It still has a loooong way to go before it reaches pre-recession levels and it still faces very real and pressing threats to its growth. First and foremost is slowing global demand. Exports to the U.S. and euro zone, two of its largest markets, are still well below pre-recession levels, while exports to China, whose economy has been booming, haven’t been as strong as you’d expect. Problem is, it’s hard to imagine things getting much better anytime soon. Well, at least not with the U.S. and euro zone battling debt problems, and China on the verge of overheating. And lest we forget, Japan also has to deal with the never-ending threat of deflation, a problem that has been looming over its head since way back when. So what does this all mean for the yen? Well, to be honest, not much! Markets haven’t been paying much attention to Japan fundamentals as of late. They’ve been too busy worrying about U.S. and euro zone problems, which have led the safe haven yen to the top of the charts. 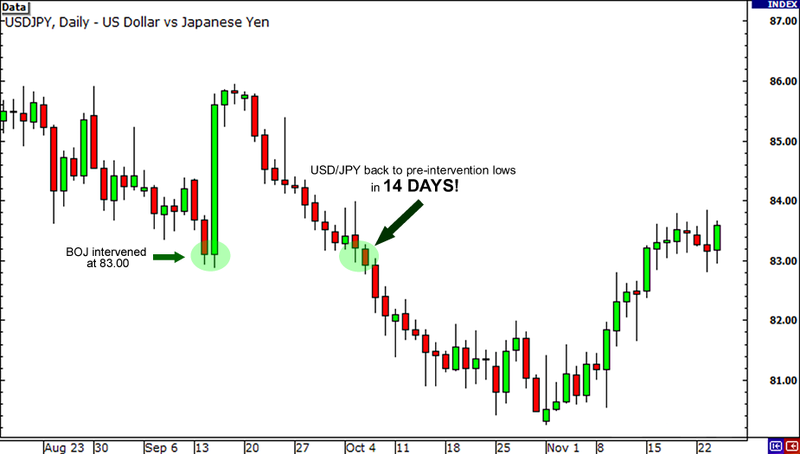 USD/JPY had been treading in the area of its all-time lows before the Bank of Japan (BOJ) intervened this morning. Judging by the way things are going so far, it might not be long before we see a genuine V-shaped recovery … not in the economy, but in USD/JPY! Do you believe Japan is on a V-Shaped recovery?